USTVNow Plus allows you to watch major American Television Networks live while staying abroad with USTVNow Plus addon on Kodi. In this article you will find how to install the USTVNow Plus addon on Kodi as in 2019. Watch major American Television Networks live while staying abroad with USTVNow Plus addon on Kodi. 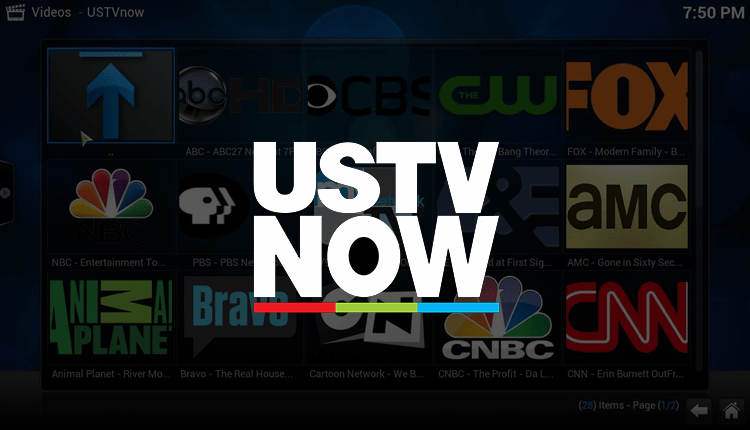 USTVNow is an Internet Protocol Television video (IPTV) service, created and developed for the U.S citizens and U.S military members living abroad. The service allows subscribed users to stream and watch American Television channels such as FOX, NBC, ABC, PBS, My9, CBS and many more. You can access all these channels using a basic free account no matter where you’re across the world with USTVNow. If you’ve been using USTVNow, you should know there’s even a better version called USTVNow plus that comes with added advantages. With USTVNow Plus, you get out updates more quickly and test out its functionality before changes are moved to the Official Release. Why USTVNow Plus Kodi Addon? USTVNow Kodi addon provides you with one of easiest and safest viewing options for U.S TV channels. The addon allows users to stream and watch live videos, TV shows, movies and much more. However, streaming all these using your own IP address is very risky. Also, some Kodi addons are geographically restricted and therefore are inaccessible to some users. As a Kodi user, you can easily find yourself receiving a copyright infringement notice from your ISP. This happens in cases where you stream copyrighted content illegally. Most Kodi addons are not transparent in how they get the content they avail, and this has made many users face legal charges. Even more, USTVNow plus together with many other Kodi addons usually provide geo-restricted content. To solve all these issues at one go, all you have to do is use a VPN. A VPN encrypts all your traffic and then sends it through an encrypted tunnel. During this process, your real IP address is spoofed and you are given a new one. This conceals your real identity and gives you access to streaming channels where the server you are connected to is allowed. However, you need to select your streaming VPN well. All VPNs are not created equal, and some are just terrible at streaming. If you want the best VPN for Kodi, I would advise you go for IPVanish. The VPN gives you super-fast speeds to stream in HD, and offers servers all over the world to help you unblock any streaming service. Here is a procedure that you can use to install USTVNow plus on Kodi. Open Kodi and click on the setting icon on your home screen. Open File Manager on the next screen. Add repository file by clicking on the add source. A dialog box will open up on the next screen. Double click on “None” option. Add the path for the repository by typing http://fusion.tvaddons.ag as the address and then click done. Enter your desired name for the repository file. You can chose any name. Press ESC Key on your PC to return to home screen. Next, tap on add-ons. On the top left corner of your screen, you’ll find an icon like unzipper, click it. Now choose the file name that you provided in step 6. Choose your Kodi version. Krypton is the latest version. On the next screen, choose “all” and then tap ok.
Once the zip file finish installing, a notification will appear in your screen telling you that super respiratory has been installed and ready for use. With the USTVNow plus Kodi addon installed, you’re now free to use your USTVNow Plus account to stream TV shows and movies from safely. Remember to turn on your VPN before using Kodi. Looking for more sports addons? Have a look on our list of the Best Sports Addons of the year.